Nat Geo, I Want To Work For You!!! I needed to reroute my hike out of Oroville for yet another fire closure in the Newby Lake area. No problem, I have no agenda! Even more, I found a cool dead rattlesnake on my road walk into Loomis that I just had to pack out (unfortunately it fell out of my pack somewhere in the middle of nowhere, as did my bear fur tuft and osprey feather). Loomis, let me tell you, was absolutely lovely. I thought I would only stop in to charge my iPad and have a cold beer, but ended up spending the night with the bartender... Don't get any funny ideas kids, Kay, my new lifelong friend invited me over after shift and we stayed up all night chatting like teenage girls. Everyone at Sully's helped to plan my alternate route up Windy Pass to rejoin the PNT. A million thanks sent your way. I'll be back one day! What a wonderful alternate. I saw my first friendly black bear of the year, ran into the PNT trail crew, and finally caught a sunset. It was a beautiful hike. And nothing like a little summer snow to keep my spirits high! 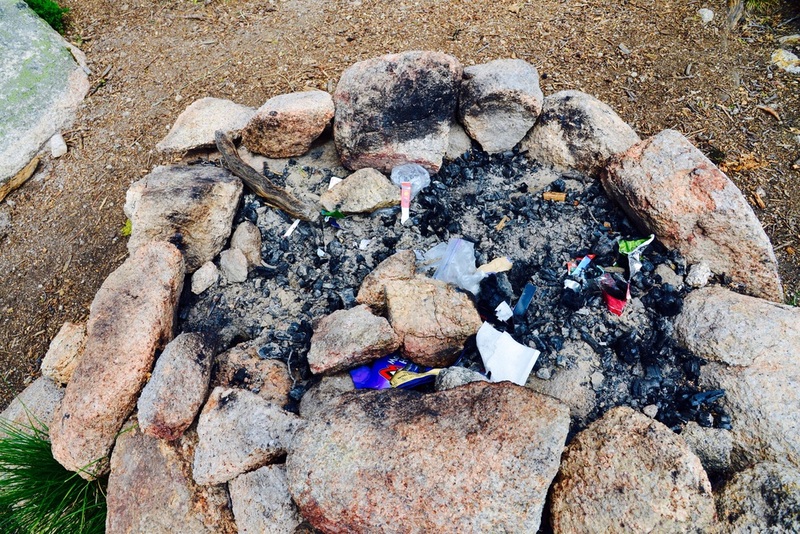 The only downside was finding a ton of litter left in a fire pit at the Dome Camp (mile 630ish). I'm sure I've unknowingly dropped a wrapper or some trash throughout my many miles, so it didn't bother me one bit to pack out what I could... especially since I'm constantly worried that the hikers behind me will think that I left the mess. Ha! Ego gives me the giggles sometimes. The hike turned grey, wet and cold. I remembered someone mentioning a storm would be passing through for several days. Meanwhile, I just entered the great Pasayten Wilderness and didn't want to miss the EPIC views. This is why I'm hiking the PNT, so I justified what I consider to be a brilliant decision: take a zero day on the mountain to line myself up with sun for the prime photo spots... Isn't that what a National Geographic photographer would do? Sure, I suppose my decision was more based out of laziness and a distaste for wet feet, but when else am I going to stay stationed alone in a sleeping bag only moving for pee breaks and fresh water? By early afternoon, the sun shined bright, but I was committed to my zero day. I stuck it out... Hot as hell... Full of pride. You get to learn about the animal behaviors and patterns when you lay still and silent. Thank God the rain finally hit at nightfall. It was perfect. I felt uneasy the next morning and asked mom to pay me a visit. She sent me a hummingbird right at a trail junction that I would have missed had I not stopped to gaze at its fluttering wings. Life is good. It was another wet day, but I hiked on through the burn zone and blowdown. There was a giant tree crossing the trail near Dead Mans Lake. An omen, I'm sure. I closed my eyes in hope on the tricky dismount and smashed my ankle in agonizing pain. If a hiker screams in the forest and nobody hears her, did it really happen? I wish someone could have seen me crawling down the trail on all fours... Must have been a sight! It took me about an hour to muster the courage to stand up, and limp into camp, but I made it. My ankle was the size of a grapefruit and I was days away from people. I considered my options... if it was serious enough in the morning, my shortest option would be to enter Canada without a passport (I did happen to have a paper photo copy on me) and beg for mercy; 18 miles. The PNT joined the PCT about 8 miles from trail, so, I could hike out at Harts Pass where I knew there would be plenty of people and a ranger station; 35 miles. Or, hike on as planned and pick up my resupply box at Ross Lake; 57 miles. Ross Lake, baby, here I come. I remember saying once that it's going to take a broken leg to bump me off, and my leg ain't broke! Ibuprofen, white light, evergreen oil and elevation at night. I may have slowed down a bit but I'm still here. Oh, and the sunny photo ops... I'm so glad I took that zero because it was some of the best hiking of my life... Even with a limp!